This week, the (non-existent) dog did not eat my homework; this week my homework looked like the (non-existent) dog's breakfast so I did not submit it. This week we studied black and white photographs. Our assignment was to shoot an evocative black and white portrait of someone, striving to capture through your lens some aspect of your model’s personality. Then, to deepen your understanding of the role of value and texture in your portrait, you will recreate it in a collage medium made from small pieces of newsprint (newspaper). Obviously I disregarded the newsprint recommendation and decided to go with black and white fabrics. I took this photo of him during our 25th wedding anniversary trip to Arizona. This photo was taken in the Painted Desert. I have seen some spectacular fabric collages submitted by other students and they amaze me. Mine amazes me by how amazingly awful it is. I might try this technique again, but I probably not on a black and white portrait. I thought about what I wanted to get out of this class -- to try new techniques and use them to further my current interests in quilting. My current interest in quilting involves thread. Lots and lots of thread. I transferred the photograph to fabric and then covered it with thread. Lots and lots of thread. I am in the process of binding this quilt and am pretty happy about the result. 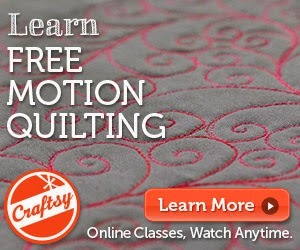 I have seen this technique on quilts hanging in quilt shows and wondered if it wasn't cheating a bit. After trying it myself, I realized that it is not cheating; there is definite skill and artistry involved in added the right colors and textures to enhance the photograph. I want to try David's technique, too. I received good value for dollar with this class (the class was free, but still...). I have learned about new techniques, learned new things about myself, made some interesting discoveries, and gained respect for those who work with different techniques than I do. I am leaving town to work at a quilt show so I will likely not do this week's assignment at all, but I am interested to learn and see what how the other students approached it. Remember my fabric postcard giveaway? I picked a winner. It's Celia Ambrose. Celia, please contact me at debbybrownquilts (at) gmail.com with your mailing address and I'll pop this into the mail for you. I have a friend named John and John is a quilt enabler. He buys me luscious quilty-inspiration books. First, I drool all over the books and then I sketch like crazy, wanting to make all sorts of new quilts based on what is contained within the pages. I love John. Check out John's great blog and you will love him too! It is full of history and pictures of old quilted garments and line drawings of old quilting patterns. Swoon! You could buy it here. I Think They Liked It? Remember my art homework from last week? peer 1 → I like this work pretty much. It was really original to chose textile for mail art. The only thing I did not have enough - text. You can continue your work with embroidery letters. peer 4 → You captured the scents of summer. I liked your use of the gingham to represent a picnic table cloth and reinforce your theme. I enjoyed sitting with my summer memories, trying new fabric techniques, and playing with Hazel, my sweet Sweet Sixteen. Having my peers like my project was unnecessary, but nice to hear. Are you familiar with the Quilt Alliance? Click the link and go there now, because you should be. They do great work. They are holding an auction to support their work, and I wanted to donate a quilt. I was a wee bit late with it (three months on the road, teaching, will cut into one's quilting time) but I finally finished the quilt. The theme this year is TWENTY, because they are twenty years old. In case this quilt does not simply scream TWENTY at you, I want to let you in on a secret: I am a nerd. When I considered a twenty-themed quilt, I went straight to the periodic table of elements. Calcium has the atomic number of 20. This is a calcium molecule. I am positive that every entry in this twenty-themed auction will be related to the calcium molecule, aren't you? Even if I am alone in the quilt auction, I am in good company in my nerd-dom. Daniel Radcliffe thinks about the periodic table of elements, too! After you are done laughing at us, remember to bid on the Quilt Alliance quilts to support this organization. I don't have a dog, and my art class project is done ahead of schedule -- imagine that! This week's assignment was Correspondence with Memory. We were to create a piece of Mail Art. My piece is called Scents of Summer. I was considering my childhood memories and my happiest memories were of summer: crowds of peonies, stands of rhubarb, fruit preserves bubbling on the stove, and a towering lilac under my second-floor bedroom window. In my mind, I saw how to create these with fabric. My 'design wall' consists of my hallway (good lighting!) and some painter's tape. I stitched them down using a pinky-purple metallic thread from WonderFil (8897). I was pleased with the result and then set to work on the rhubarb. I selected WonderFil Mirage (rayon -- SD.09) and grabbed my Handi Quilter Straight Edge Ruler. I created the aromas using WonderFil Spagetti (12 weight cotton -- SP02, SP08, SP15). Now I am going to shock you. The next step was to Cut It Into Pieces. Later today I will write the artist's statement and submit the assignment, but the grade will be unimportant. I had so much fun making this. I tried many new techniques and threw some of those attempts away. I learned as much from the failing as I did from the succeeding. I made an extra notecard and will mail it to one person selected at random from the comments. Tell me anything -- a quilting success, a quilting failure, your favorite summer memory, etc. Comment deadline, midnight Eastern Time on Friday June 21. Teri did her homework early this week too. See how she interpreted the assignment here. Remember last week's art assignment? I received my assessment. They "got" it. I was worried that working in fabric would cause confusion, but they understood me. "Thank you for sharing your piece of art. I can see not only hope in your ... work but I see an entire universe in these forms and structures. I especially love the circles and the little balloon at the bottom. The colored rayon threads adds vitality and hope. " "WOW! This is stunning! I have dabbled in quilting myself, so am appropriately wowed at the intricate, detailed quilting in each of those squares. I love that you even considered the weight of your thread to stress the importance (or lack thereof) of the lines. I can sense the chaos in not knowing what each day will bring - with each and every square on the right having a different quilting pattern. 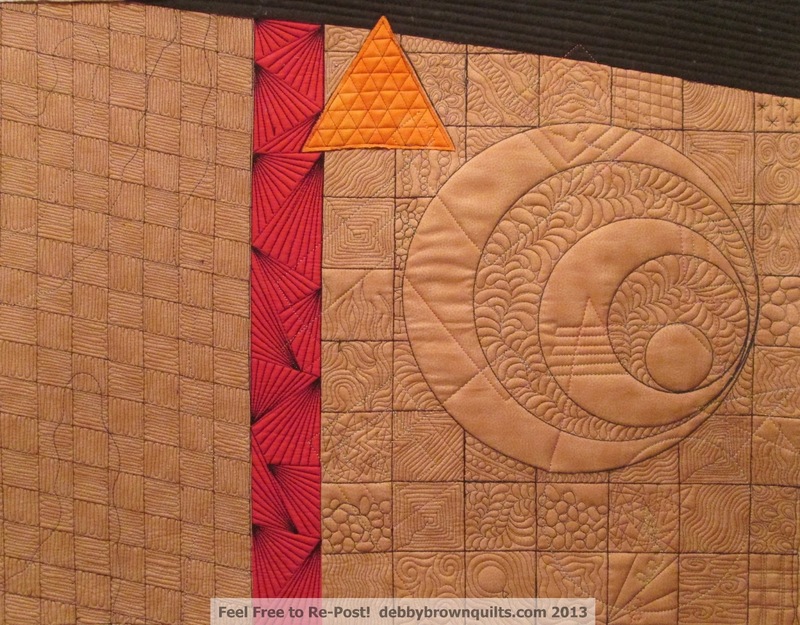 I can also see the calm and peace in the sameness of the quilting on the left. The red and orange really pops against the background and does bring some sense of hope and life to the artwork. " I am really satisfied with this piece and did not need the positive affirmations, but they never hurt. Do they? I already took a few risks and confessed that I am taking an online art course. Teri confessed that she is taking this class, too. Teri and I have become experts at messaging "in progress" photos to each other. I am beyond blessed to be able to share ideas with her and grateful that technology can let us work together, separately, in our own studios (60 miles apart), at the same time. Using cotton fabric, cotton batting, and assorted threads, I machine quilted this 17 x 22 -inch quilt. I used a medium-weight black cotton thread to stitch most of the straight lines, a heavy-weight black cotton thread to define the large circles, and a light-weight black polyester thread to create texture. Over the top of the quilting, I used thick variegated rayon threads to add more texture. Quilting is my passion. Everything I do, see, experience, or feel can be realized by fabric and thread. When considering Fantastic Art, I was intrigued by Jean Arp and wanted to incorporate an element of chance in my design. I rolled a die to determine the placement of the large circles in relationship to each other. The colors and shapes are representative and not true to scale. 1. Do not micro-quilt with black thread for 4 hour straight. I am now blind. 2. Anguish is part of the process. I was ready to destroy this quilt about half way through. Fortunately it looked better after a few hours of sleep. 3. Deadlines are a good thing, but not when binding is involved. I promise that I will bind this quilt eventually. No, really, I will. I have not yet had the strength to look at the next assignment. This one nearly wore me out! It's the April/May 2013 issue. Do you have it? If so, turn to pages 90-92 to the "Quilting Tips from the Pros" article. I was one of the "Pros" quoted. A photo of my quilt, Kermit, is on the bottom of page 92. Lucy A. Fazely wrote the article. I was so honored to meet her (on the phone). If you only know me through my blog and my FaceBook page, you would think that my life consists of Hello Kitty, chocolate cake, and quilting (not necessarily in that order). In fairness, a lot of my life is full of Hello Kitty, chocolate cake, and quilting, but there is so much more that I choose to keep to myself. I am taking an online art class. Some people look at my quilts and say, "Wow, you are an artist!" but in my heart I do not believe that. I am a "skilled practitioner" in the art of quilting but when I meet a true artist, I am humbled. They have something that I lack. So many of my friends in the quilt world are amazing artists. I do not want to copy them, but I want to be able to think like they do (if that makes any sense at all). When I took art class in school, the teachers tried to be encouraging, "Good effort. Try Home-Ec." I took an Art Quilting class as an adult but quit attending when the teacher informed me that I was "doing it wrong." Either this third try will be the charm, or I will be out with my third strike. Time will tell. I applied some of the things the teacher taught about: color, texture, and density. It should surprise no one that I chose to use fabric and thread instead of paint and brush. The lessons about artists so far have been interesting. I am a museum junkie and divide paintings into "like" and "don't like" categories. I love when I visit a new museum in another city and turn the corner to see an old friend hanging on the wall, "Well hello, Mr. LeWitt! So good to see you here!" Other artists I just don't get and don't think about too much. I hope this class will help me to think about them in a different way. I am taking a risk by taking the art class and trying new things, but I am also taking a risk by letting you know about it. My heart is actually pounding as I consider hitting the "publish" button. In the last 97 days, I have spent exactly 19 days at home. Most of the "away" days were work days, which were fun. The rest of the "away" days were vacation days, which were even more fun. During that time, I have been to or through 20 states and 2 foreign countries (Canada and Australia). I cannot count the number of hotel rooms or the miles on the rental cars, and I refuse to consider the number of miles flown. Is it ok to admit that I am tired? It is? Good, because I am tired. I am surprised to discover that through the fatigue and exhaustion, I am creatively energized. I have spent the last few months teaching quilting and going to quilt shows, but I have not been quilting. It is like being to bakery after bakery and never eating cake. Shudder. I am home for 21 days. TWENTY-ONE DAYS! I cannot remember the last time I spent this many days in a row at home. I plan to lock myself in my studio and quilt. Is the theme too subtle? 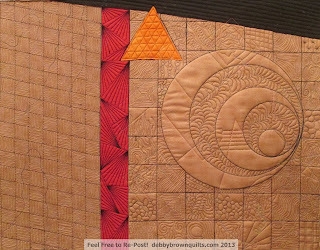 This quilt is 8.5x11 inches; it is reverse appliqued and quilted using WonderFil InvisiFil threads. I love InvisiFil Thread!!! I plan to quilt and quilt and quilt some more in the next few weeks. I will keep you posted on my progress.